More gems from the travel writing section of the NY Times. 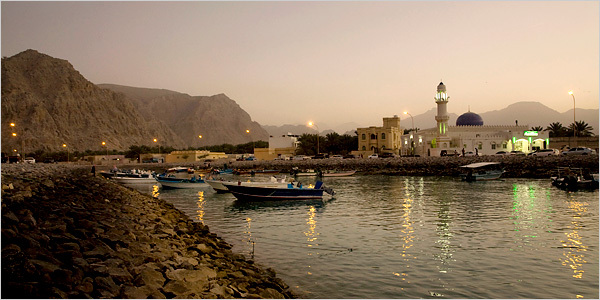 This time, we travel to the new Middle East hot-spot — Khasab, Oman! The landscape looks like Utah, the ladies are mysterious, and it’s in a country you’ve never heard of before! But before I go further: Orientalist Cliche Count — GO! Ok, not too many this time, but the article is only 500 words. Not to repeat myself, but what separates orientalist descriptions of a place from legitimate descriptions of a place? I mean, if there are Omani women wearing flowing black head scarves, then what should prevent us from describing this? Context. Travel writing is all about the “exotic” and the “unique” or “edgy.” Women cease to be human in this type of writing; they are objects of the orientalist’s attention. We have to ask why the author chose to point out this observation out of all other possible observations. Either way, I’ve got a bigger problem with this piece: luxury hotels. When a town like Khasab becomes a tourist stop, a sad fate awaits. In other Oman news, Cheney met with Oman’s leader Qaboos. Cheney, who is seen as a leading hawk on Iran, is going on what is described as a Mideast trip to try to give a boost to stalled Israeli-Palestinian peace talks. But he has also scheduled two other stops: One, Oman, is a key military ally and logistics hub for military operations in the Persian Gulf. It also faces Iran across the narrow, vital Strait of Hormuz, the vulnerable oil transit chokepoint into and out of the Persian Gulf that Iran has threatened to blockade in the event of war. Cheney is also going to Saudi Arabia, whose support would be sought before any military action given its ability to increase oil supplies if Iran’s oil is cut off. Back in March 2002, Cheney made a high-profile Mideast trip to Saudi Arabia and other nations that officials said at the time was about diplomacy toward Iraq and not war, which began a year later. U.S. News and World Report via Informed Comment. When will the NY Times get sick of writing stories on Arabs and camels? In order to portray a society as “foreign” or an individual as an “other,” you must cast their customs, rituals, or even daily activities as something exotic or peculiar. This entry in the “Riyadh Journal” from the NY Times typifies the practice of creating an other. This time of year, when the weather here is still cool and comfortable and the flowering plants and shrubs are everywhere, how better to spend a day than to be out in the desert with beautiful camels? To be sure, the untrained eye [read: Western, –ed] might find it hard to appreciate such beauty. But here, camel aesthetics can be evaluated according to a series of precise and exacting standards. 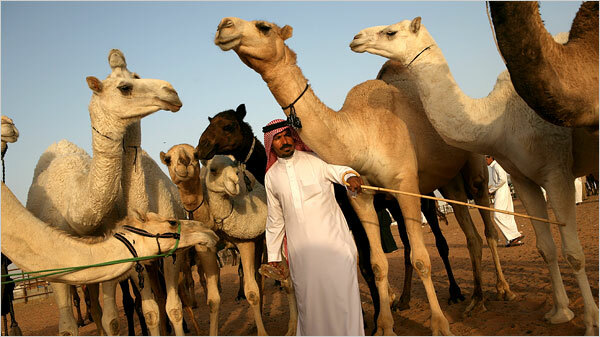 As he spoke, Mr. Madr was surveying the offerings at Saudi Arabia’s largest camel market, on the outskirts of Riyadh. The souq al-jamal, as the market is called in Arabic, sprawls over the open desert for so many acres that it is handy to have a car to drive from pen to pen. The article labels camel contests as “camel beauty pageants” (a term which I am sure is not directly translated from Arabic). The author has chosen to portray a camel contest as something bizarre by elaborating on the comparisons between females and camels — perhaps the author is also trying to imply that Arabs treat their camels better than women. Either way, if the author had visited the Houston Livestock Show and Rodeo — which has several contests that judge steers, goats, and pigs based on their appearance — I doubt that the coverage would’ve been so suggestive. Security has improved. Security has improved. Security has improved. The surge was successful. The surge was successful. The surge was successful. Five years in Iraq and the network triumvirate — ABC, NBC, CBS — has produced special segments to commemorate the day. ABC News brings us “Iraq 5 Years Later: Where Things Stand” which presents a pretty optimistic portrait of the current security situation in Iraq. The anchor announces that “security is a bright spot” in Iraq and attributes this success to the troop surge. Interestingly, they have an interview with a female from Fallujah who says that the security situation is a “million times” better than a year ago. Of course the security situation is better in FALLUJAH from a year ago since that city saw some of the worst fighting in Iraq and now that the violence has lessened — even a little bit — the security situation has improved. Ask someone in Baghdad about the security situation and I do not believe the answer would be as optimistic. The report is equally optimistic by reporting the “dramatic reduction in violence” in Iraq and attributes this to the surge. Oh, and guess what? If you don’t support the war on Iraq, the troops hate you. CBS News (sans Katie Couric) has reached many of the same conclusions as NBC and ABC with their segment “Iraq: 5 Years Later,” namely that there has been a reduction in violence and this reduction in violence is due to the troop surge. I do not believe these conclusions are accurate, but the CBS report is of a vastly higher quality and seems more realistic than the two other broadcasts since it acknowledges that Iraqis are suffering from unemployment, lack of water and electricity, and they do not want to live under a foreign military occupation. It is also noteworthy that both the anchor and correspondent are females — in contrast with the other male-dominated broadcasts. You are currently browsing the Press Critiques category at the news in arabic.